Rachel Zeffira - Elizabeth Harvest (Original Motion Picture Soundtrack). Vinyl LP. Bleep. They love a soundtrack over at Invada, don’t they. 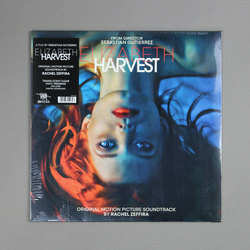 The latest OST released via Geoff Barrow/Ashley Anderson/Fraser Stuart’s label is Rachel Zeffira’s music for Sebastian Gutierrez’s Elizabeth Harvest. Anyone who has heard any of Zeffira’s previous output - from her previous scoring and arrangement credits to the work she has produced alongside Faris Badwan in Cat’s Eyes - will already be aware of her prodigious talents. With this collection she utilises many of the tools at her disposal. Chamber pieces that have been bent by electronics into strange new shapes, re-renderings of Erik Satie and wordless dream-folk numbers all feature among her evocative compositions for Elizabeth Harvest.